The New England Patriots will open their 2019 campaign with a blockbuster clash against the Pittsburgh Steelers, the NFL ­revealed Wednesday as the schedule for the league's centenary season was unveiled. A push to sack Israel Folau over his anti-gay comments could pose problems for Rugby Australia and its boss Raelene Castle, with expensive consequences at stake for both sides. 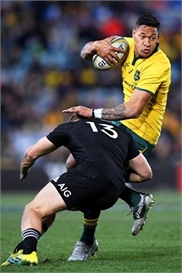 The devoutly Christian player has opted to challenge a decision to terminate his multi-year, multi-million-dollar contract with the Wallabies and NSW Waratahs over homophobic social media posts. The Tampa Bay Lightning were sent crashing out of the Stanley Cup playoffs on Tuesday as the Columbus Blue Jackets completed a stunning first-round clean sweep with a 7-3 victory in Ohio. Xianlin in Nanjing, East China's Jiangsu Province hosted a half marathon on Sunday, with 12,000 runners participating. Formula One is in talks with six local governments in China this week about holding a second Grand Prix in the country, a senior Formula One official told AFP, with a Beijing road race said to have been floated. The Carolina Hurricanes made their first home playoff game in a decade a successful one by trouncing the defending Stanley Cup champions Washington Capitals 5-0 on Monday. Lewis Hamilton led the Mercedes to a one-two finish with his teammate Valtteri Bottas at the Formula One Chinese Grand Prix in Shanghai on Sunday, but their third top-two podium finish in a row seemed not enough to ignite the Chinese audience. The 2019 Tianshan Marathon will be held on June 30 in Jimsar county, Changji Hui Autonomous Prefecture in Northwest China's Xinjiang Uyghur Autonomous Region, organizers announced on Saturday at a press conference. The world athletics governing body, International Association of Athletics Federations (IAAF), has closed an ethics investigation into its president Sebastian Coe after finding there was no basis on which "any disciplinary case could be established" that he had "intentionally misled" a British Parliamentary Committee in 2015.